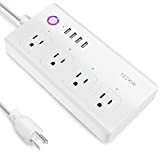 When a single WI-Fi smart plug from a big consumer electronics brand costs between $20 and $30, you’d have to be crazy to buy one instead of a gadget like the Teckin Smart Power Strip. Why? Because it costs about the same price and it’s four Wi-Fi smart plugs in one! There are four separate power outlets that each can be controlled individually using Alexa or Google Assistant, and it also has four powered USB ports for all your phones, tablets, and more. 【Simple To Use】Smart WIFI Strip that Compatible with Alexa and Google Home Assistant,remotely control your lights and devices from your phone wherever you have internet. Such as 3G/4G/LTE, no hub or subscription required, just plug in and set up according to the instruction. 【Control Electric Appliances & Devices】Easy to set up in Smart Life APP via 2.4G WIFI network, and each outlet and USB port can be named individually, then voice control by Alexa/Echo/Google Home.You can remote control your household appliances.You can also create timer to schedule control this wireless multi outlets power bar. 【Multipurpose】Equipped with 4 smart outlets and 4 USB charging port with 5FT extendable power cord and indicator lights for travel, home or office, provide a convenient power supply for home appliances such as fan, water dispenser, electric pot, TV, humidifier, lights, holiday decorating lights. 【Safe first】Flame retardant materials housing prolong service life. 100~240V available voltage range supports small or large power home appliances while adds security. 【Quality Guaranteed】Teckin Smart WIFI Plug is FCC, ETL approved product.If you encounter any problem or need further support, please feel free to contact us through E-mail or Amazon directly. For our contact info:support.us@teckinhome.com . We offer free replacement service anytime and for any reason if the plug is defective, please contact us whenever you encounter product issue.